Following a solid Yale education in Physics and Electricity, he spent the decade between 1900 and 1910 improving the wireless telegraph, but he quickly tired of its limitations of sending coded messages. 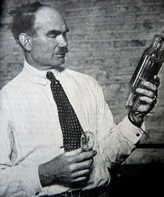 In 1906 he filed his first patent for the vacuum tube he called the Audion, describing it as a detector of sound. By 1907 he had invented an arc-based radiotelephone transmitter and Audion receiver, and he was writing about the possibility of sending music into homes by wireless. 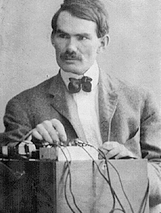 Between 1910 and 1920 he improved his Audion as a detector, an amplifier, and later a transmitter of radio. He started several radio stations. He was an early if not the first broadcaster of entertainment-based audio, primarily opera music. Between 1920 to 1930 he invented, patented and improved upon a system of recording a sound track on a strip of film, thus allowing accurate synchronization with the picture. 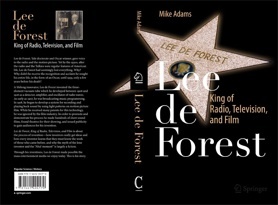 Lee de Forest invented the Talking Motion Picture. Lee de Forest, 1873-1961, was an inventor and scholar who made significant contributions to the science of electronic communications during the first three decades of the Twentieth Century. 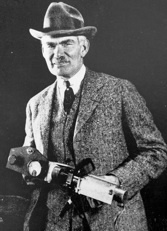 He held numerous patents on the technology of radio, television and film.